Two new models are presented for the purpose of improving on our phytoclimatic taxonomy of 1966. Using Gaussen-type graphs, the morphogenetic model classifies the limited types of thermal and precipitation curves to be found on the Earth and their degrees of intersection, all in accordance with values corresponding to actual breaks in phytological continuity. This taxonomy is presented in the form of keys generating a periodic system, and is illustrated with a world map showing most types by means of graphic symbols. It is effective for the prediction of broad phytological types and on any chorological scale. The integral model consists of a more sensitive numerical taxonomy based on the establishment of predictive biunivocities. This taxonomy may be applied not only to the supra-annual compendia (t ≥13 years) for which it was designed, but also to annual events, provided not less than 13 are assembled at a time and the frequency of each type is specified, Given these conditions, the arrangements of types obtained through the supra-annual numerical and qualitative systems often coincide both mutually and with orders of frequency in time and cartographical vicinity. This lends our cartography a rather novel dynamic character. 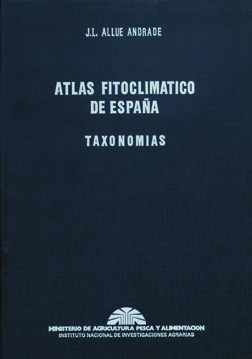 The model as devised are for the Peninsular Spain and the Balearics, with numerical programs (both computerized and manual), qualitative keys, analytical spectra of main sites —besides Walter-Gaussen climodiagrams—, a 1:1.000.000-scale subregional phytoclimocartogram (subregions, sites, climodiagrams), etc. - INIA. Servicio de Publicaciones. Ctra Coruña km 7,5. 28040 MADRID (SPAIN). Contact: distri@inia.es. Tel: (34) 91-3471493. This book was added to our online catalog on Wednesday 05 June, 2013.